Quick note: I am doing this tutorial on Mac but it will be quite similar for Windows and Linux as well. Now we are ready to create our “Hello world” application, where we start our journey. Create folder on your computer and the file inside with the name tutorial-webservice.go (or any other you like) and put the following code inside. The tag application should have the same ID as your project ID in Google Developer Console, everything else leave the same as shown above. 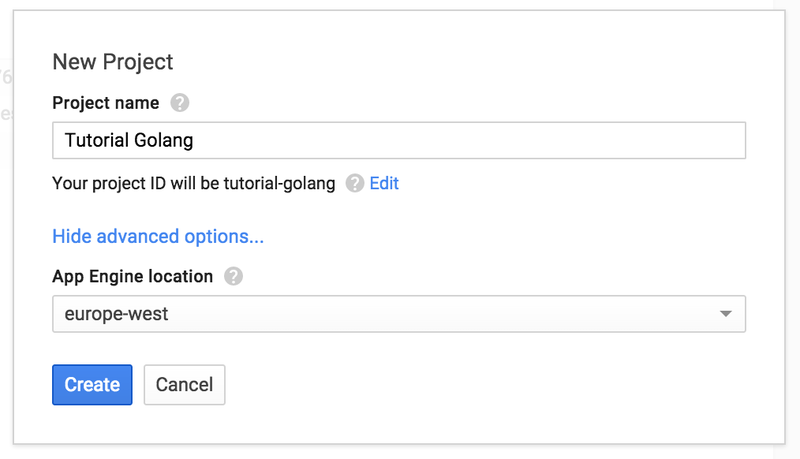 Probably you are lazy as me and do not want to invent your own bicycle to create the webservice, that’s why let’s reuse the prepared solution and also learn how we can easily reuse Golang packages created by other people. I like a lot martini, it is a powerful package for quickly writing modular web applications/services in Golang, as they describe themselves. 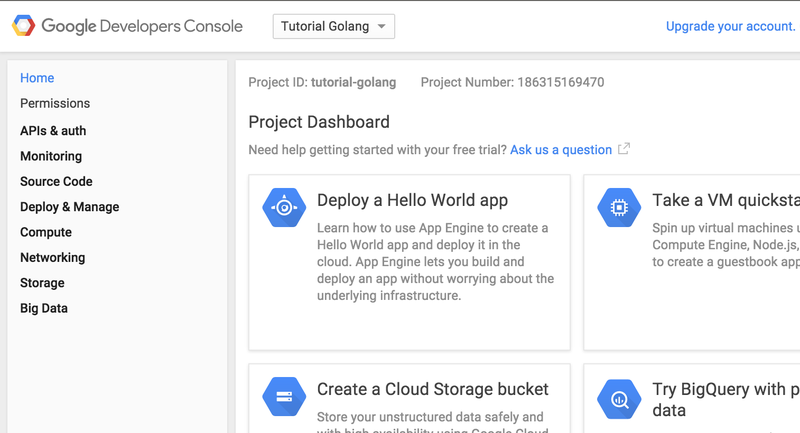 This command will download and install the package locally and later it will be used also when we will deploy application to GAE (Google Application Engine). That’s it, the magic is done! return "My first GO webservice (using martini package)"
Now it is time to check our project in google developer console, go to the menu Compute->App Engine->Dashboard as shown below and you should have similar picture. Click on the link in the right top corner to see as your application is actually working. return "My first GO webservice: use /math/sum as GET or /math/multiply as POST"
I use another additional binding package for martini to simplify processing of the post data (install with “goapp get github.com/martini-contrib/binding“), transformation from GO structs to JSON is golang standard (package “encoding/json“), everything else looks more or less self explanatory. 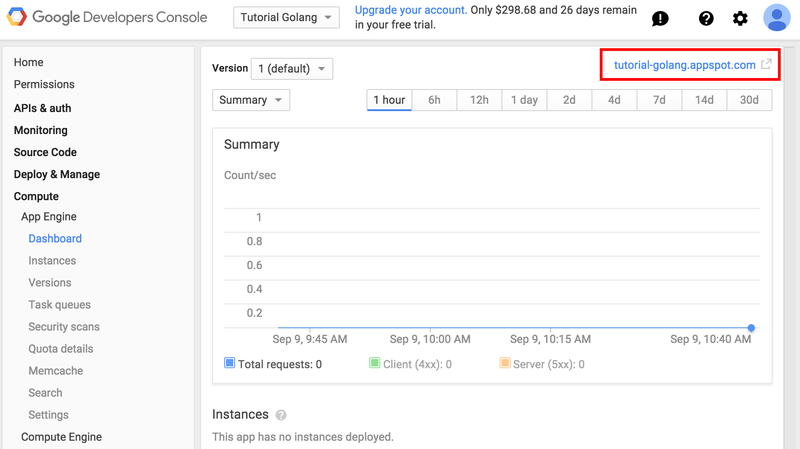 Stay tuned, there will be one more additional part explaining how to work with GAE Cloud SQL from GO and how to store your code in GAE git repository. If you want to use Sublime Text to develop with GO for GAE, check these tips. This entry was posted on September 25, 2015, 23:02 and is filed under admin, development, tutorials. You can follow any responses to this entry through RSS 2.0. You can leave a response, or trackback from your own site.